1 photographic print : b&w; : 5 x 7 in. 2 negatives : b&w; ; 4 x 5 in. 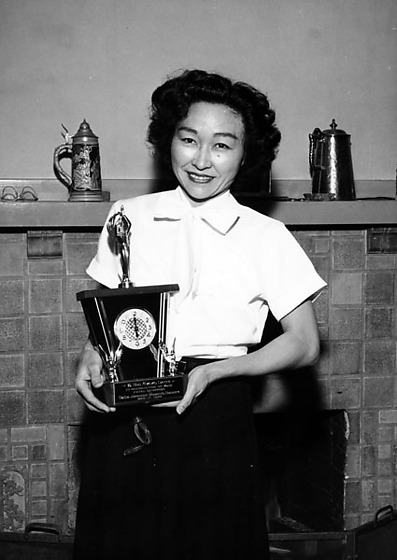 Dressed in a white blouse and belted skirt, Ayako Okita receives an award from the Southern California Japanese Women's Society inside what appears to be a residence, California, March 15, 1958. The award is clock with three winged figures and a plaque on base, "To Mrs. Ayako Okita, in recognition of your filial devotion, So. Cal. Japanese Women's Society, March 15, 1958." Includes individual portrait with award and a group portrait with several women, a man and a girl. Typed on original negative envelope: Nikkei Fujinkai -- c/o Mrs. Furusawa.